The seaside Town of Marshfield is known as the “Town of Villages” because the town is made of eight distinct villages. Marshfield has a rich history of colonial style architecture. 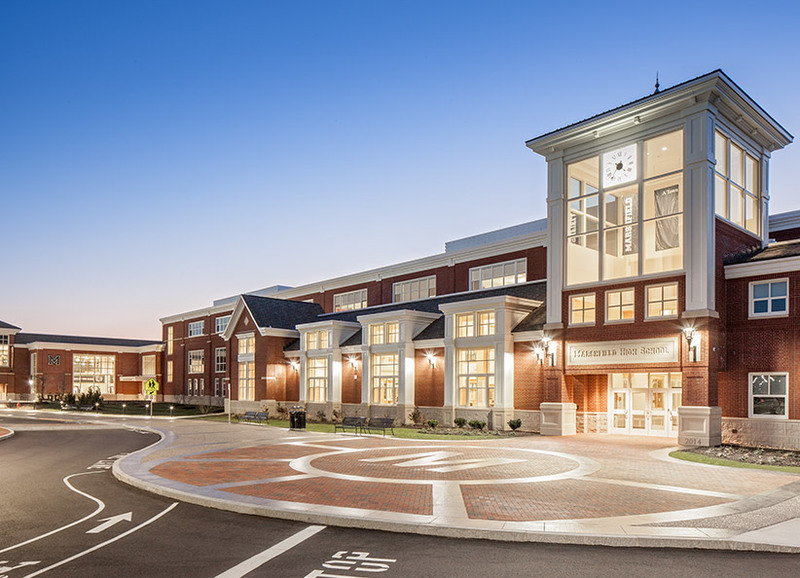 The new high school building’s exterior design is inspired by the local architecture that successfully scales down the three-story structure into separate villages creating a more welcoming environment for students and the community. The school is organized around a centrally located courtyard that allows natural light and ventilation for all of the 9-12 grade classrooms. The comprehensive high school offers specialized and unique instructional space for boat building and marine fabrication, engineering, building construction, manufacturing, nutrition, and robotics. The new school is located on the same site as Marshfield’s elementary and middle schools and the building is carefully situated to enhance Marshfield’s educational campus. The project incorporates many sustainable design features and is designed to be LEED Gold Certified.